Lithe and lysten gentylmen, that be of frebore blode, I shall you tell of a good yeman, His name was Robyn Hode. Due to the excellent work of the people at the the University of Cambridge, I managed to get my hands on a facsimile copy of the earliest printed Robin Hood text, A Lytell Geste of Robyn Hode (c.1450). To anyone who is, well, not me, this is probably not exciting. But anyway it occurred to me that I hadn’t actually written anything upon the text from which my website takes its name. So here goes. Let me say now that I am not a medieval historian, nor am I a Middle English specialist; my specialism is 18th- and 19th- century Robin Hood literature. The exact date that it was printed is not known, although it is said to be between the late 15th and early 16th centuries. Its composition, however, probably dates back, according to James C. Holt, to c.1450. Robin is a very different character to the one we would see on our TV screens today. I know I’ve used that phrase a lot on my website, but of Robin Hood it is true; over time the legend snowballed and collected different aspects, evolving along the way. Firstly,Robin is not the Earl of Huntingdon; Robin’s elevation to the peerage came in the 16th century with Anthony Munday’s two plays, The Downfall of Robert, Earle of Huntington (1598), and The Death of Robert, Earl of Huntingdon (1601). Instead Robin is described as a ‘yeoman.’ There is debate amongst scholars about what exactly this term meant but, generally, it is someone who was of middle rank in medieval society. Robin Hood is not a peasant. There is no Maid Marian or Friar Tuck in these poems. These characters were later additions to the legend. Neither is the Geste set in the time of “good” King Richard and “bad” Prince John. Instead it is set in the time of an un-numbered King Edward. The Robin Hood of the Geste is a very different figure compared to what we’d recognise today! The Sheriff of Nottingham is still there, however, despite the fact that the poem is set in the Forest of Barnsdale. There are also references to Doncaster, UK. The Yorkshireman in me wants to say that this is firm proof that Robin Hood was a Yorkshireman but, alas, I cannot, for another early ballad, Robin Hood and the Monk, is set in Sherwood. Fitts 1 and 2 deal with the impoverished knight who is lent money by Robin to regain his lands from the rapacious church; in the later part of Fitt 4 the same knight returns to repay Robin. In the “interlaced” episode, Fitt 3 and the first part of Fitt 4, Little John, whom Robin has sent to serve and help the knight, is sought as a servitor by the sheriff: he leaves the sheriff’s house disgruntled by his poor treatment, brings with him the Cook, and then traps the sheriff into entering the forest and losing his possessions. The second part of the Gest starts in Fitt 5 with the Sheriff’s archery contest and trap, after which the outlaws take refuge with the knight of Fitt 1. He is then, Fitt 6, kidnapped by the sheriff and rescued by the outlaws, who kill the sheriff…Fitts 7 and 8 offer a version of the well known “King and Subject” theme in which the King in disguise meets, then in some way conflicts with, one of his subjects, and the result is honor both to the king’s flexibility and also the subject’s deep-seated loyalty. In the Gest King Edward meets, engages with, and at least symbolically joins the forest outlaws. But different from Adam Bell, his offer for Robin to join his court is not successful, and the poem ends with Robin’s return to the greenwood, unhappy with the inactive and expensive nature of court life. The last stanzas, more a palinode than a climax, sketch in the story of Robin’s death. Like other heroes he is betrayed by someone close to him and leaves a shrine and a noble memory. For he was a good out lawe, and dyde pore men moch god. This seems like it has been tagged on to the end, for nowhere in the whole of the Geste does Robin help any poor people or peasants. And yet, whilst it is not explicitly stated that Robin steals from the rich and gives to the poor, I’d like to think that whoever heard (or read) this text implicitly understood that he did. After all, in how many of our modern-day film adaptations of the legend do we actually hear Robin utter the words: “I steal from the rich and give to the poor”? The answer, of course, is never; we implicitly understand that he does, and it does not need saying. I cannot stress enough, however, that I am not a medieval scholar, and that last sentence really is speculation on my part. Unfortunately, we cannot gaze into the minds of medieval people to see if this was the case. Despite being written in Middle English, it’s fairly intelligible to the modern reader. 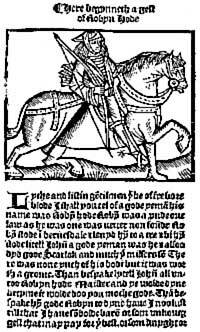 It’s the most “biographical” of all early Robin Hood texts, unlike, for instance, Robin Hood and Guy of Gisborne, or Robin Hood and the Monk, which recount only episodes from the outlaw’s life. You encounter Robin Hood in all his guises in this poem: he is Bold Robin Hood, the leader of a band of outlaws, and he is also a trickster. 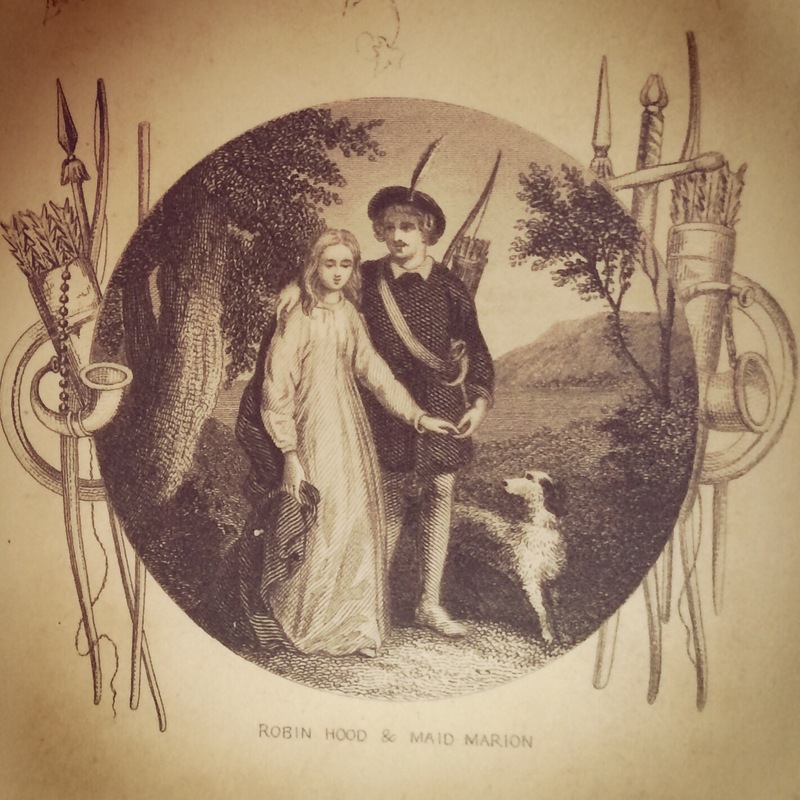 The first time that this poem was made available to a book reading audience was in Joseph Ritson’s Robin Hood: A Collection of All the Ancient Poems, Songs, and Ballads, Now Extant, Relative to that Celebrated English Outlaw (1795). 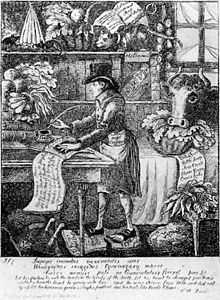 Thankfully, Ritson preserved the Middle English spelling, whilst later antiquaries “translated” it into Modern English, which I think robs it of some of its power; the Geste, and other early English texts, are the primitive poetry of the nation, part of our heritage. As such, the antiquary in me wants to see them preserved in tact, so to speak. It’s quite a long poem, but if you ever want to read it in full, click here – though it’s quite long!